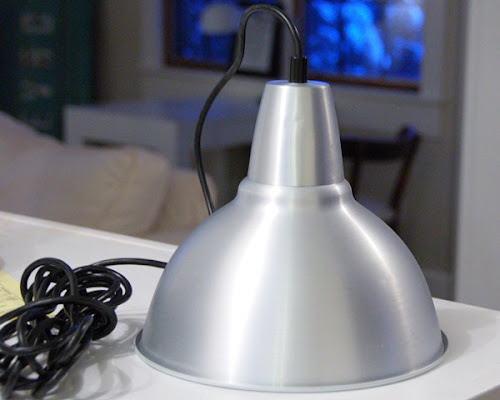 I stumbled across a blog post recently where a smart, smart lady had turned IKEA's Foto Pendant into a DIY barn light for over her kitchen sink and I said to myself, "self! 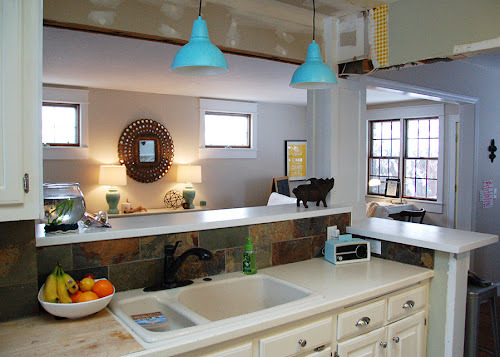 $14.99 for a pendant is just the right price for your kitchen." So that's what I did. An old neighbor of mine in Salt Lake traveled to Idaho this past weekend for a family function, and before making the trip she was kind enough to grab a couple pendant lights at IKEA for me -- what a gal, saving me seven hours of driving (and some unknown amount of money... IKEA is dangerous like that). These pendants come with a plug so I had to have to flex my electrical muscles. And I'm mildly afraid of electricity so really I made my husband do most of it. Since he never works on house projects with me, it's secretly fun when I get to rope him into helping me out... quality time, you know. In the interest of full disclosure, I also purchased a couple of ceiling canopy kits for about $6 each which brought the grand total to $21 a pendant. And since this was a little jury rigged, I also had to tie a fancy knot in the cord above the metal cross bar to keep the pendants at the right height, which means we assembled the light and the ceiling kit first, tied the knot in the cord and then my husband mounted the whole unit to the ceiling (as seen in the photos below). Lucky for us (him) this pendant weights next to nothing, so it wasn't a big deal. I'm not 100% sold on the color I chose (Krylon's Ocean Breeze) as I was hoping it would be a little more muted. I think I might like Krylon's Catalina Mist on these, but then I'd have a pair of Catalina Mist pendants right next to a pair of Catalina Mist lamps, so maybe I should find a new color for those living room lamps before I do anything hasty! Or maybe spray paint companies need to come out with more colors. Just a thought. I like blue lights, okay? I totally love that blue you chose. Amazing! Super cute idea! I love that blue! love the idea and the color..it could be so cute any color anywhere! Love 'em... I may just have to get down to Ikea. I LOVE them, and I really love the fact that you spray painted the canopy kits to match. Great idea! Thanks for linking to my project!!! How about rubbing them with some antiquing wax, something like Annie Sloan Dark Wax, just to slightly mute the blue? It's very pretty :-) I am VERY lucky, I have two IKEA stores in my city, one less than ten minutes drive and one about a half hour drive.....I don't go too often!! 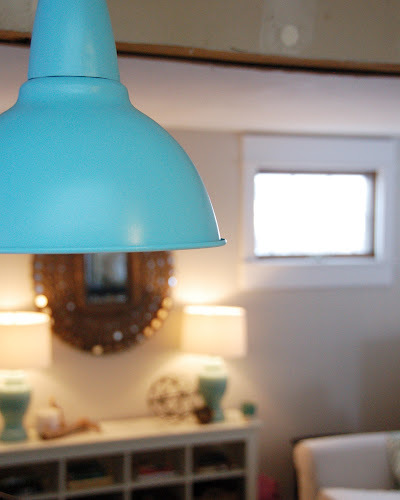 Hi Anna, I just purchased the Foto pendant for our basement remodel. When we went to hang it, we realized it was just a plug-in fixture. 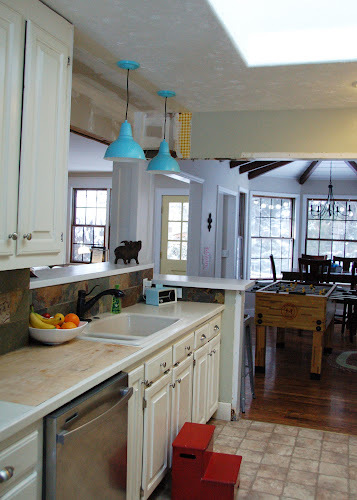 Did you install outlets in your ceiling to hang your pendants? Thanks so much. Sadie, you can just have an electrician hard wire those into your ceiling very easily or do it yourself, I don't think it's difficult, I think that is what Anna has done here? Thanks Tracey, your comment reminded me I had forgotten to reply to Sadie! We did do it ourselves, if you cut the plug off there is a black and white insulated wire inside, just like a regular fixture. Just trim it to a rough length first so you don't have oodles of cord. You can search for tutorials on how to hardwire plug-in lights online, too :) Good luck! A career in ethical hacking is highly profitable because there is an increasing demand for ethical hackers.